After publishing the article “impact of memory reservations” I received a lot of questions about setting memory reservation at resource pool level. It seems there are several common facts about resource pools and memory reservations that are often misunderstood. Because reservations are used by the VMkernel\DRS resource schedulers and (HA) admission control, the behavior of reservation can be very confusing. Before memory reservation on resource pool is addressed, let look at which mechanisms uses reservations and when reservations are used. When are reservations actually used besides admission control? If a cluster is under-committed the VM resource entitlement will be the same as its demand, in other words, the VM will be allocated whatever it wants to consume within its configured limit. When a cluster is overcommitted, the cluster experiences more resource demand than its current capacity, at this point DRS and the VMkernel will allocate resources based on the resource entitlement of the virtual machine. Resource entitlement is covered later in the article. Is there any difference between resource pool level and virtual machine level memory reservation? To keep it short, VM level reservation can be rather evil, it will hoard memory if it has been used by the virtual machine once. Even if the virtual machine becomes idle, the VMkernel will not reclaim this memory and return it to the free memory set. This means that ESX can start swapping and ballooning if no free memory is available for other virtual machines while the owning VM’s aren’t using their claimed reserved memory. It also has influence on the slot size of High availability, for more information about HA slot sizes, please visit the HA deep dive page at yellow-bricks.com. For more information about virtual machine level memory reservation, please read the article “impact of memory management“. Now setting a memory reservation on a resource pool level has its own weaknesses, but it is much fairer and more along the whole idea of consolidation and sharing than virtual machine memory reservations. RP level reservations are immediately active, but are not claimed. This means it will only subtract the specified amount of memory from the unreserved capacity of the cluster. RP reservations are used when children of the resource pool uses memory and the system is under contention. Reservations are not wasted and the resources can be used by other virtual machines. Be aware, using and reserving are two distinct concepts! Virtual machines can use the resource, but they cannot reserve this as well if it is already reserved by another item. It appears that resource pool memory reservations work almost similar to CPU reservations, they won’t let any resource go to waste. And to top it off, resource pool reservations don’t flow to virtual machines, they will not influence HA slot sizes. Which unfortunately can lead to (temporary) performance loss if a host failover occurs. When a virtual machine is restarted by HA they are not restarted in the correct resource pool but in the root resource pool, which can lead to starvation. Until DRS is invoked, the virtual machine need to do it without any memory reservations. How to use resource pool memory reservation? The process of divvying is rather straightforward if the memory reservation equals the configured memory of the virtual machines inside the resource pool. All pages by the virtual machines are backed by machine pages, the resource entitlement is at least as large as its memory reservation. What I find more interesting is what happens if the resource pool is configured with a memory reservation that is less than all virtual machine configured memory? DRS will divvy memory reservations based on the virtual machine resource entitlement. So how is resource entitlement calculated? A virtual machines resource entitlement is based on various statistics and some estimation techniques. DRS computes a resource entitlement for each virtual machine, based on virtual machine and resource pool configured shares, reservations, and limits settings, as well as the current demands of the virtual machines and resource pools, the memory size, its working set and the degree of current resource contention. Now by setting a reservation on the resource pool level, the virtual machines who are actively using memory profits the most of this mechanism. Basically if no reservation is set on the VM level, the “RP” reservation is granted to all virtual machines inside the resource pool who are actively using memory. DRS and the VMkernel calculates the resource pool and the virtual machine share levels. Please read the article “the resource pool priority-pie paradox” to get more information about share levels. and use this to specify the virtual machines priority. When we create a “Diva” VM (coined by Craig Risinger), that is setting VM level reservations, this allocation setting is passed to the VMkernel. It will subtract the specified amount of the reservation pool of the RP and it will not share it with others, i.e. the Diva VM is a special creature. As stated above, RP memory reservations flow more than VM-level reservation, it will not claim\hoard memory. So basically when setting a resource pool reservation, reservations are just a part of the computation of the virtual machines resource entitlement. When the host is overcommitted, the memory usage of the virtual machine is either above or below the resource entitlement. If the memory usage exceeds its resource entitlement, the memory is ballooned or swapped from the virtual machine until it is at or below its entitlement. my colleagues and good friends Duncan Epping and Craig Risinger helped me decipher some out-of-this-world emails from the crew above and participated in some excellent discussions. I have a customer who wants to set memory reservation on a large scale. Instead of using resource pools they were thinking of setting reservations on VM level to get a guaranteed performance level for every VM. Due to memory management on different levels, using such a setting will not get the expected results. Setting aside the question if it’s smart to use memory reservation on ALL VM’s, it raises the question what kind of impact setting memory reservation has on the virtual infrastructure, how ESX memory management handles memory reservation and even more important; how a proper memory reservation can be set. The OS inside the guest maps virtual memory ( VPN) to physical memory(PPN). 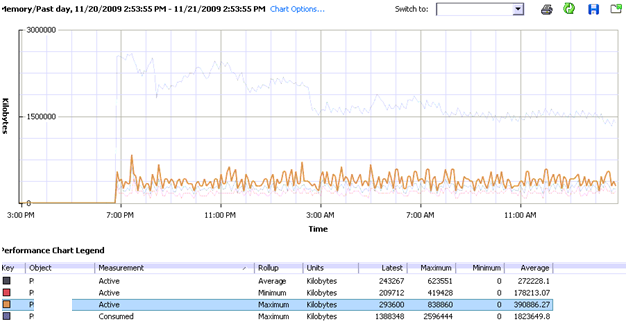 The Virtual Machine Monitor (VMM) maps the PPN to machine memory (MPN). The focus of this article is on mapping physical page numbers (PPN) to Machine Page Number (MPN). Memory reservations guarantee that physical memory pages are backed by machine memory pages all the time, whether the ESX server is under memory pressure or not. Opposite of memory reservations are limits. When a limit is configured, the memory between the limit and the configured memory will never be backed by machine memory; it could either be reclaimed by the balloon driver or swapped even if enough free memory is available in the ESX sever. Next to reservations and limits, shares play an important factor in memory management of the VM. Unlike memory reservation, shares are only of interest when contention occurs. The availability of memory between memory reservation and configured memory depends on the entitled shares compared to the total shares allocated to all the VMs on the ESX server. This means that the virtual machine with the most shares can have its memory backed by physical pages. For the sake of simplicity, the vast subject of resource allocation based on the proportional share system will not be addressed in this article. One might choose to set the memory reservation equal to the configured memory, this will guarantee the VM the best performance all of the time. But using this “policy” will have its impact on the environment. When a VM is powered on, admission control checks the amount of available unreserved CPU and memory resources. If ESX cannot guarantee the memory reservation and the memory overhead of the VM, the VM is not powered on. VM memory overhead is based on Guest OS, amount of CPUs and configured memory, for more information about memory overhead review the Resource management guide. Configured memory is the amount of “physical” memory seen by guest OS. For example; configured memory of VM is 2048MB – memory reservation of 1024MB = Swapfile size = 1024MB. ESX use the memory reservation setting when calculating the VM swapfile because reserved memory will be backed by machine memory all the time. The difference between the configured memory and memory reservation is eligible for memory reclamation. When free memory is greater or equal than 6%, the VMkernel is in a HIGH free memory state. In a high free memory state, the ESX host considers itself not under memory pressure and will not reclaim memory in addition to the default active Transparent Page sharing process. When available free memory drops below 6% the VMkernel will use several memory reclamation techniques. The VMkernel decides which reclamation technique to use depending on its threshold. ESX uses four thresholds high (6%), soft (4%) hard (2%) and low (1%). In the soft state (4% memory free) ESX prefers to use ballooning, if free system memory keeps on dropping and ESX will reach the Hard state (2% memory free) it will start to swap to disk. ESX will start to actively reclaim memory when it’s running out of free memory, but be aware that free memory does not automatically equal active memory. If a virtual machine has a memory reservation but has not yet accessed its full reservation, the unused memory can be reallocated to other virtual machines. memory, and will not reclaim it, even if the virtual machine becomes idle and stops accessing memory. To recap the info stated in the Resource Management Guide, when a VM hits its full reservation, ESX will never reclaim that amount of reserved memory even if the machine idles and drops below its guaranteed reservation. It cannot reallocate that machine memory to other virtual machines. But when will a VM hit its full reservation exactly? Popular belief is that the VM will hit full reservation when a VM is pushing workloads, but that is not entirely true. It also depends on the Guest OS being used by the VM. Linux plays rather well with others, when Linux boots it only addresses the memory pages it needs. This gives ESX the ability to reallocate memory to other machines. After its application or OS generates load, the Linux VM can hit its full reservation. Windows on the other hand zeroes all of its memory during boot, which results in hitting the full reservation during boot time. This behavior will have impact on admission control. Admission control on the ESX server checks the amount of available unreserved CPU and memory resources. Because Windows will hit its full reservation at startup, ESX cannot reallocate this memory to other VMs, hereby diminishing the amount of available unreserved memory resources and therefore restricting the capacity of VM placement on the ESX server. But memory reclamation, especially TPS will help in this scenario, TPS (transparent page sharing) reduces redundant multiple guest pages by mapping them to a single machine memory page. Because memory reservation “lives” at machine memory level and not at virtual machine physical level, TPS will reduce the amount of reserved machine memory pages, memory pages that admission controls check when starting a VM. TPS cannot collapse pages immediately when starting a VM in ESX 3.5. TPS is a process in the VMkernel; it runs in the background and searches for redundant pages. 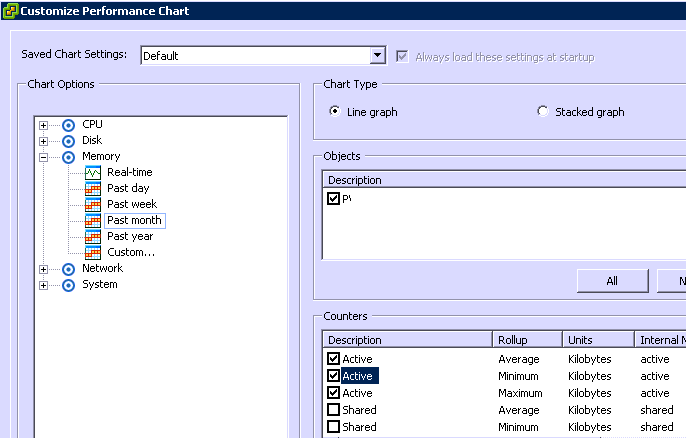 Default TPS will have a cycle of 60 minutes (Mem.ShareScanTime) to scan a VM for page sharing opportunities. The speed of TPS mostly depends on the load and specs of the Server. Default TPS will scan 4MB/sec per 1 GHz. (Mem.ShareScanGHz). Slow CPU equals slow TPS process. (But it’s not a secret that a slow CPU will offer less performance that a fast CPU.) TPS defaults can be altered, but it is advised to keep to the default.TPS cannot collapse pages immediately when starting a VM in ESX 3.5. VMware optimized memory management in ESX 4; pages which Windows initially zeroes will be page-shared by TPS immediately. Setting memory reservation has impact on the VM itself and its surroundings. Setting reservation per VM is not best practice; it is advised to create resource pools instead of per VM reservations. Setting reservations on a granular level leads to increased administrative and operational overhead. But when the situation demands to use per VM reservation, in which way can a reservation be set to guarantee as much performance as possible without wasting physical memory and with as less impact as possible. The answer: set reservation equal to the average Guest Memory Usage of the VMs. Guest Memory Usage shows the active memory use of the VM. Which memory is considered active memory? If a memory page is accessed in mem.sampleperiod (60sec), it is considered active. To accomplish this you need to monitor each VM, but this is where vCenter comes to the rescue. vCenter logs performance data and does this for a period of time. The problem is that the counters average-, minimum and maximum active memory data is not captured on the default vCenter statistics. vCenter logging level needs to upgraded to a minimum level of 4. After setting the new level, vCenter starts to log the data. 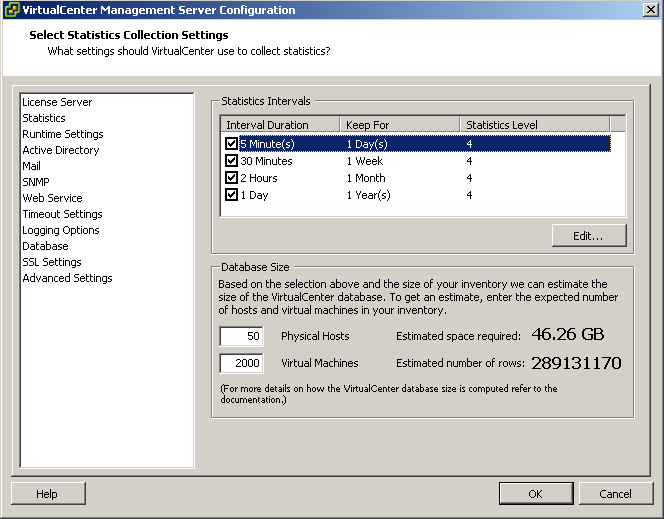 Changing the statistic setting can be done by Administration > VirtualCenter Management Server Configuration > Statistics. Select the counters consumed memory and average-, minimum- and maximum active memory. The performance chart of most VMs will show these values close to each other. As a rule the average active memory figure can be used as input for the memory reservation setting, but sometimes the SLA of the VM will determine that it’s better to use the maximum active memory usage. Consumed memory is the amount of host memory that is being used to back guest memory. The images shows that memory consumed slowly decreases. The active memory use does not change that much during the monitored 24 hours. By setting the reservation equal to the maximum average active memory value, enough physical pages will be backed to meet the VM’s requests. While memory reservation is an excellent mechanism to guarantee memory performance levels of a virtual machine, setting memory reservation will have a positive impact on the virtual machine itself and can have a negative impact on its surroundings. Memory reservation will ensure that virtual machine memory will be backed by physical memory (MPN) of the ESX host server. Once the VM hit its full reservation the VMkernel will not reclaim this memory, this will reduce the unreserved memory pool. This memory pool is used by admission control, admission control will power up a VM machine only if it can ensure the VMs resource request. The combination of admission control and the restraint of not able to allocate reserved memory to other VMs can lead to a reduced consolidation ratio. Setting reservations on a granular level leads to increased administrative and operational overhead and is not best practice. It is advised to create resource pools instead of per VM reservations. But if a reservation must be set, use the real time counters of VMware vCenter and monitor the average active memory usage. Using average active memory as input for memory reservation will guarantee performance for most of its resource requests.